US ArmyA 3rd Cavalry Regiment soldier keeping watch in a rural area adjacent to the Nangarhar police Regional Logistics Center in Afghanistan during an advising trip in 2015. US troops in Afghanistan lost a service member Thursday in an unspecified incident, according to NATO officials. The incident is believed to be the eighth death of a US service member in war-torn Afghanistan this year. The latest death of a US service member comes just a few days ahead of the 17th anniversary of the start of the war in Afghanistan. A US service member was killed in action Thursday, Operation Resolute Support said in a statement. The person’s name is being withheld pending notification of the person’s family. Thursday’s death is believed to mark the eighth this year for US troops in Afghanistan. In early September, a US service member was killed in a noncombat incident, and one day prior another died in an insider attack. Another apparent insider attack in July claimed the life of a 20-year-old Army soldier. Casualties among Afghan forces are on the rise. About 500 Afghan troops were reportedly killed in September. 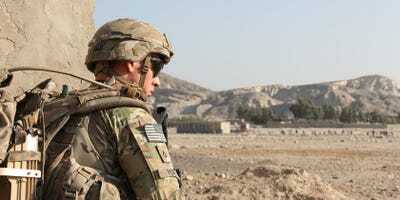 The latest American death comes just ahead of the 17th anniversary of the start of the war in Afghanistan, which began October 7, 2001, in the wake of the 9/11 terrorist attacks. Children born after the deadly attacks are now old enough to enlist to fight in the war, a bloody stalemate with no clear end in sight. Army Gen. Joseph Votel, the commander of US Central Command, told reporters Thursday that the Taliban could seize the initiative in short campaigns but couldn’t sufficiently hold territory to secure victory.